The Filipinas Copyright Licensing Society, Inc. recently signed bilateral agreements with the Georgian Copyright Association (GCA) and the Vietnam Reproduction Rights Organization (VIETRRO), making a total of 15 bilateral agreements with RROs from different countries. 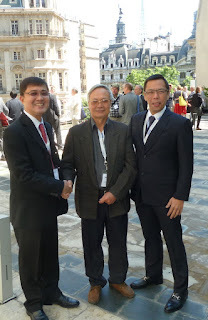 The agreements were concluded by FILCOLS board member and CentralBooks executive Jose Paolo M. Sibal and FILCOLS executive director Alvin J. Buenaventura at the International Federation of Reproduction Rights Organizations (IFRRO) World Congress and annual general meeting held in Buenos Aires, Argentina in October 2012. Bilateral agreements between collective management organizations (CMOs) or RROs are guided by the principle of national treatment. Championed by the Berne Convention for the Protection of Literary and Artistic Works (Berne Convention), the principle of national treatment provides that foreign and local rightsholders be treated equally in countries who signed the international treaty. Rightsholders refer to authors, publishers, heirs of authors, and other entities mandated partly or fully to manage copyright. This means that Filipino authors are protected by law in Georgia with the same level of protection given to Georgian authors. In the same manner, Georgian authors are protected by law in the Philippines with the same level of protection given to Filipino authors. Also known as “repertoire swap,” the bilateral agreements allow national RROs to exchange and in turn increase the body of works they manage. Due to the differences in legislation and structure of CMOs, these agreements facilitate the management of rights and exchange of remuneration. GCA is the only collective management organization recognized by the Ministry of Justice. It is a multi-purpose CMO which manages copyright and related rights in Georgia. This means that GCA performs the functions of an RRO and CMO for music, video, visual arts, and performers. FILCOLS is the national RRO which manages the secondary use of copyrighted text and image only. The Philippine music CMO is the Filipino Society of Composers, Authors and Publishers (FILSCAP). Because FILCOLS and FILSCAP manage the rights of different rightsholders, GCA signed separate bilateral agreements with them. One of the new republics in the South Caucasus, Georgia has a land area of about 69,700 sq. km. (26,000 sq. mi.) and a population of 4.7 million. It is bounded by Russia, Turkey, Armenia, Azerbaijan, and the Black Sea. In 2010, the Ministry of Home Affairs of Viet Nam approved the establishment of VIETRRO. VIETRRO is the national RRO in the Socialist Republic of Viet Nam. Viet Nam is a member of the Association of South East Asian Nations (ASEAN), it has a land area of about 331,000 sq. km. (128,000 sq. mi.) and a population of 87 million. In the past, FILCOLS signed agreements with RROs from Argentina, Australia, Colombia, Denmark, India, Japan, Kenya, Mauritius, Nigeria, Singapore, Trinidad and Tobago, UK, and US.